Pega Academy provides Pega 7 Exercise Systems for completing the course exercises. The exercise systems are packaged as virtual machine disk images and require a virtual machine player to run. 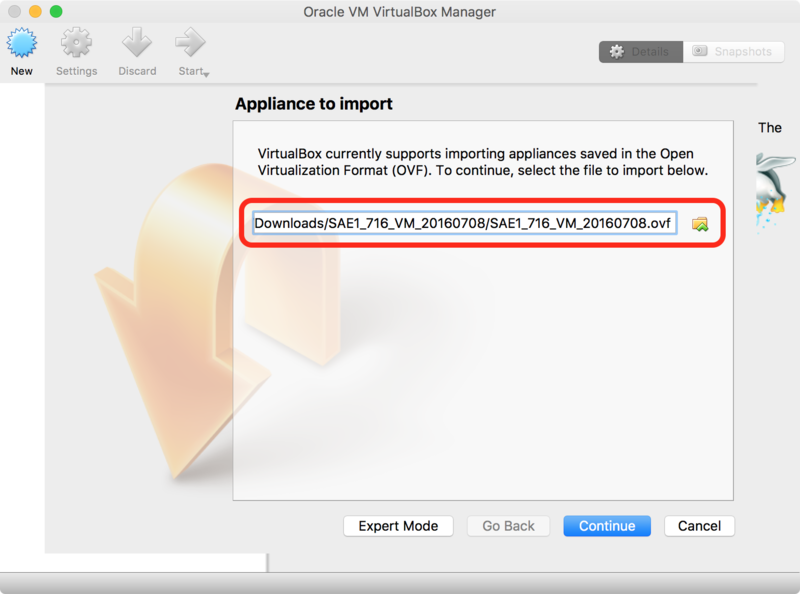 The Oracle VM VirtualBox is used to install Pega 7 on Mac OS to run the exercise system. 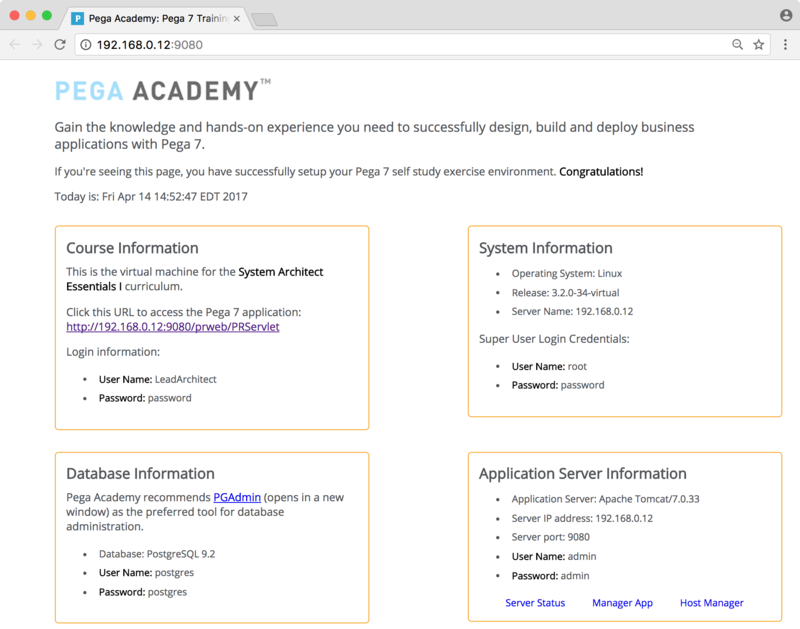 Note: A Pega Academy account and course registration are required in order to download a Pega 7 Exercise System. See the Pega Academy Course List for information on available courses and on how to register. 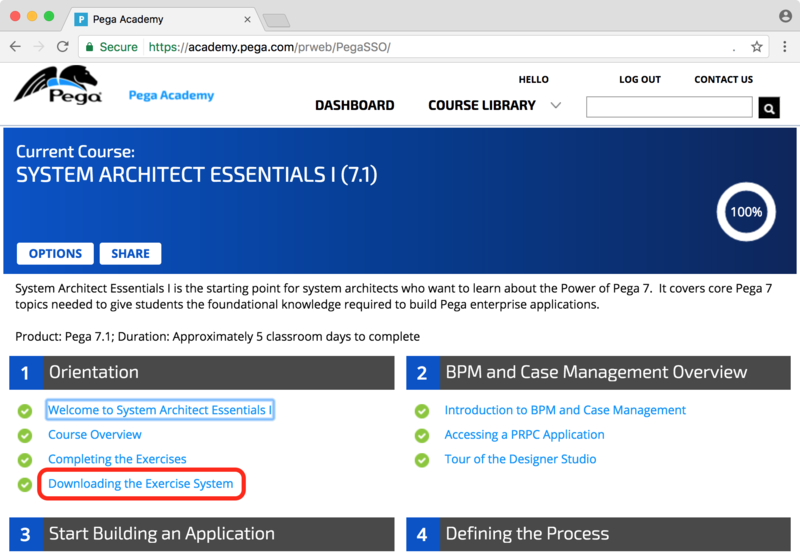 Once registered for a course, for example the Certified System Architect (CSA), login to Pega Academy and access the course. The Orientation module should contain a step called Downloading the Exercise System. Click on the link. A new dialog opens that show a download token link. Click on that token link to start the download. The Pega 7 Exercise System is quite large, here the file is about 4GB in size, and may take a while to complete. Once the download is completed, the file should be available in the Downloads folder. 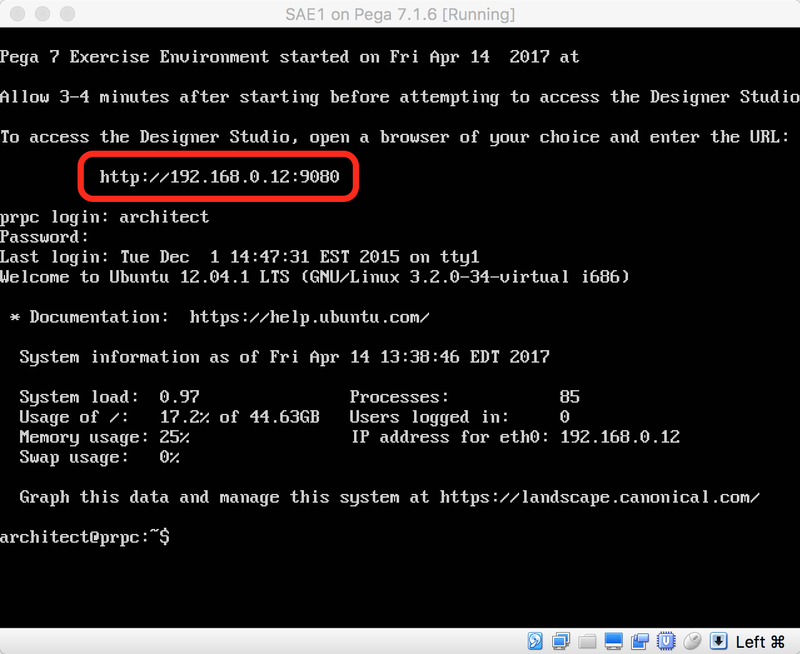 Here, the file is named SAE1_716_VM_20160708.tar. Double-click on the file to uncompress the archive to the current folder using the mcOS Archive Utility. The Download folder should now contain a sub-folder with the virtual machine files containing the Pega 7 Exercise System. In this case, there is one VMDK file (virtual machine disk) and one OVF file (Open Virtualization Format). 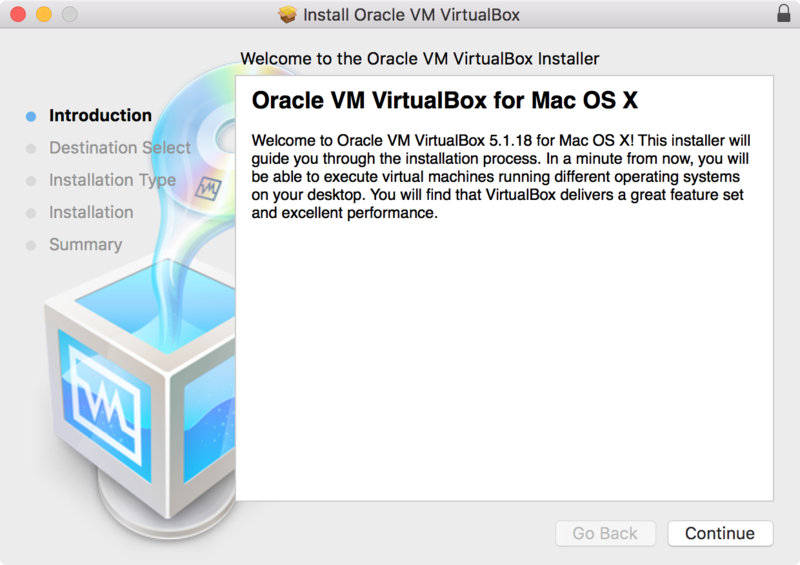 Download the Oracle VM VirtualBox for Mac OS. This application is freely available as open source software under the terms of the GNU General Public License. 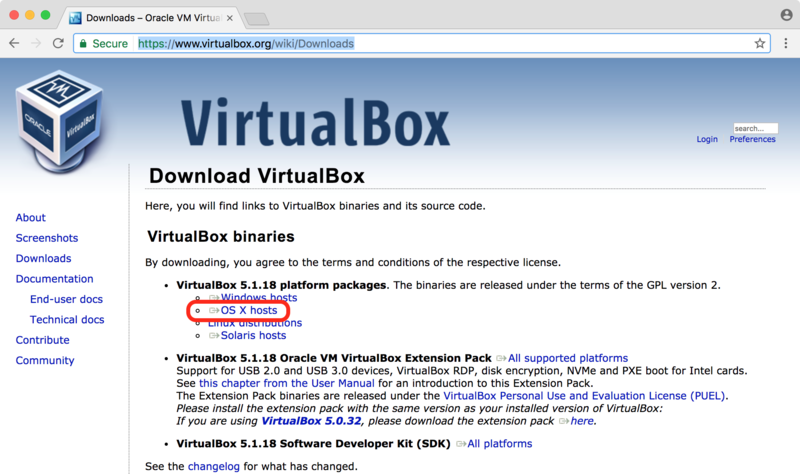 On the download page, use the OS X hosts link for the VirtualBox platform packages binaries. 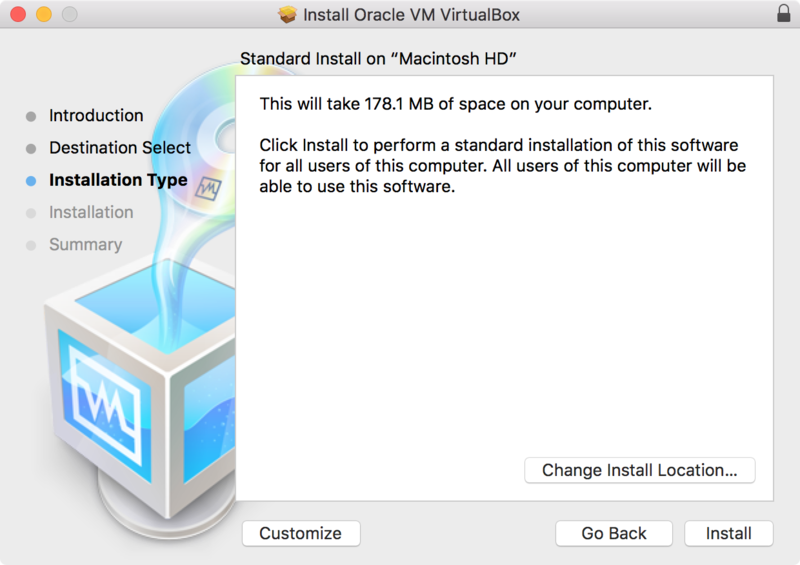 The Mac OS installer file VirtualBox-5.1.18-114002-OSX.dmg is about 80MB in size. Once downloaded, double-click on the downloaded file to start the installation. In the VirtualBox disk image window, click on the VirtulBox.pkg icon to start the installer. Click on Continue on the Introduction step. 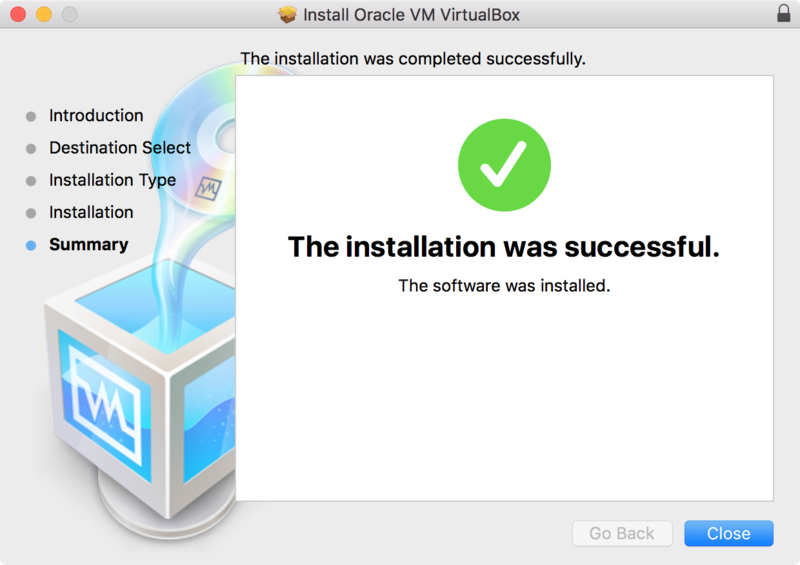 Click on Continue on the Installation Type step to install VirtualBox in the default location. Click on Close on the Summary step to close the installer. 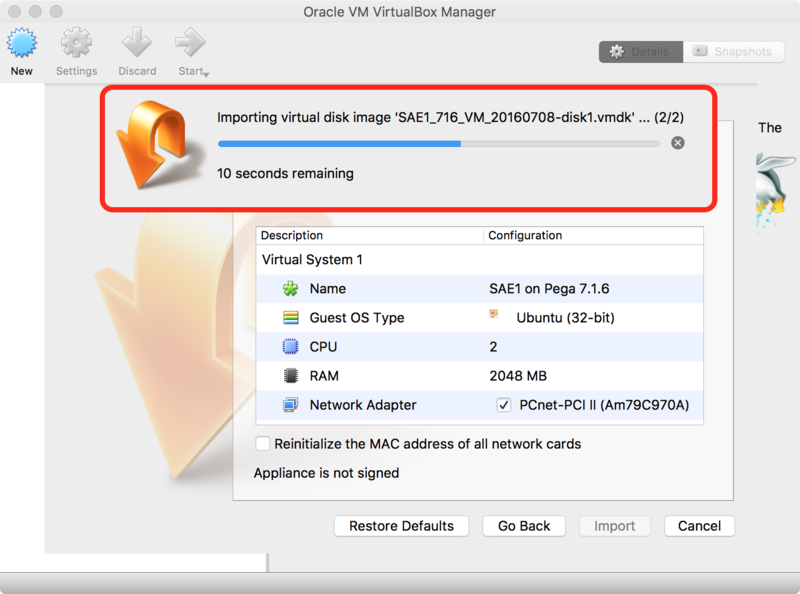 Launch VirtualBox from the Applications folder on Mac OS. In the VirtualBox application menu, click on File > Import Appliance. 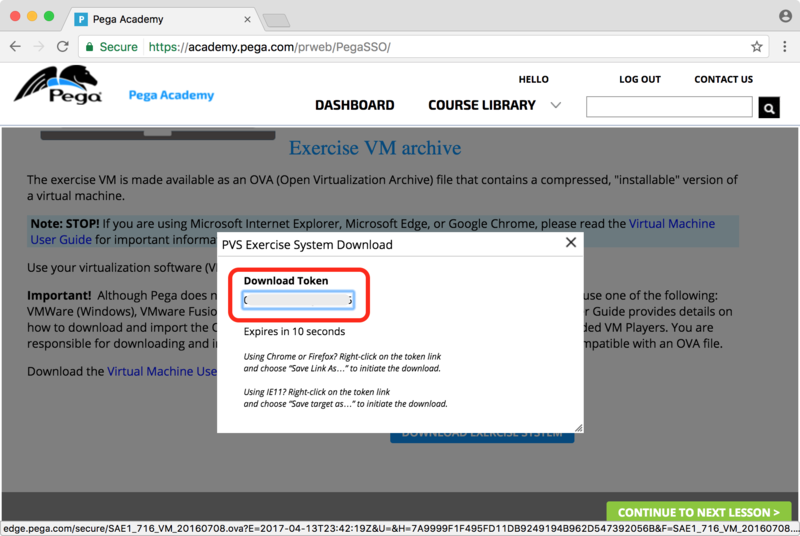 Use the browse icon to select the OVF file of the Pega 7 Exercise System, here that file is SAE1_716_VM_20160708.ovf, and click on Continue. Review the appliance settings and click on Import. The process of importing the Pega 7 Exercise System virtual machine may take a while. 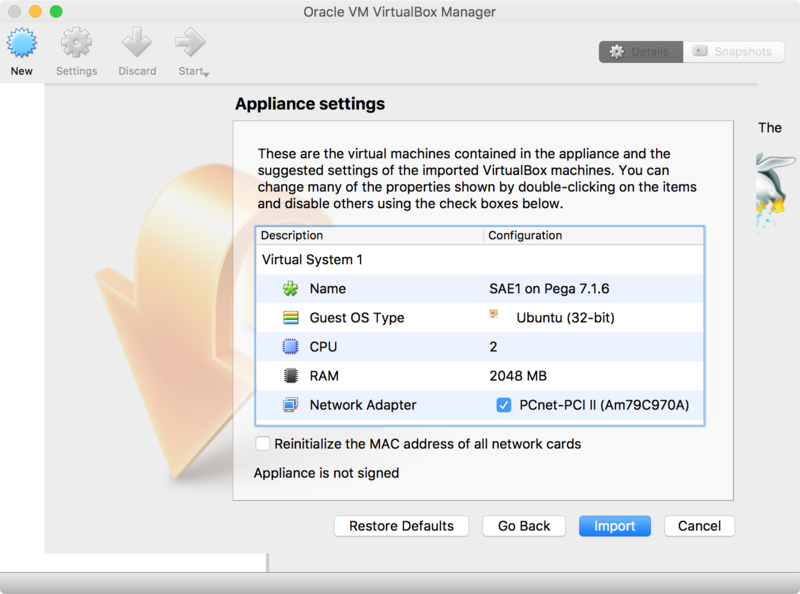 The imported virtual machine will now show up in VirtualBox. 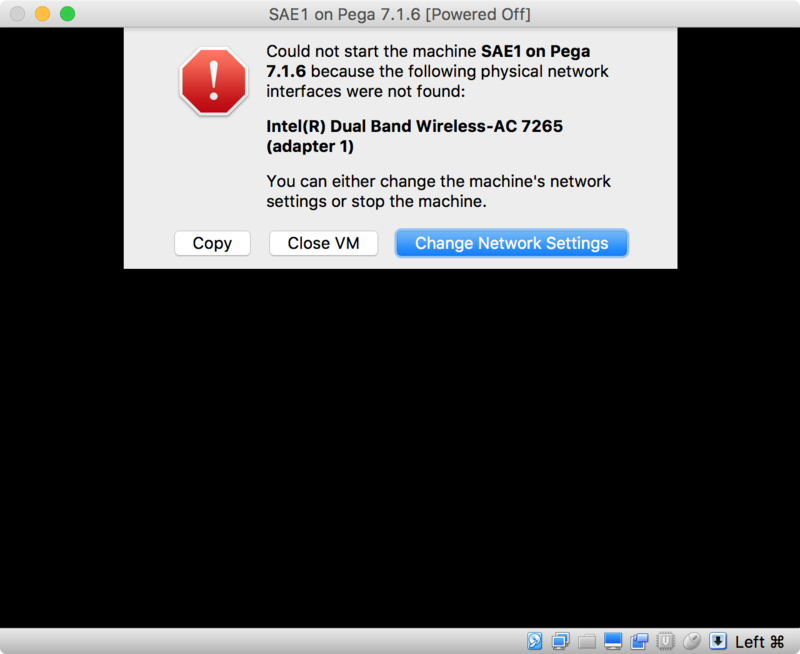 Here it is called SAE1 on Pega 7.1.6. By default, the network adapter of the virtual machine is configured to use Bridged mode. This setup is the equivalent of the virtual machine being connected with an Ethernet cable to the host machine. For more information on bridged networking, see the VirtualBox manual on this topic. 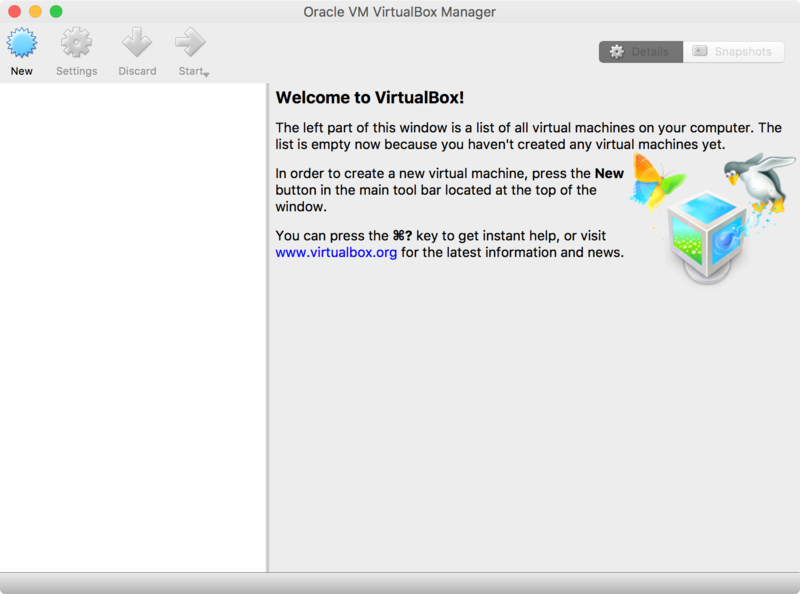 Click on the green Start icon in the VirtualBox menu to start the VM. Note: If the virtual machine does not start due to a network adapter error as shown below, it may be necessary to change the adapter. 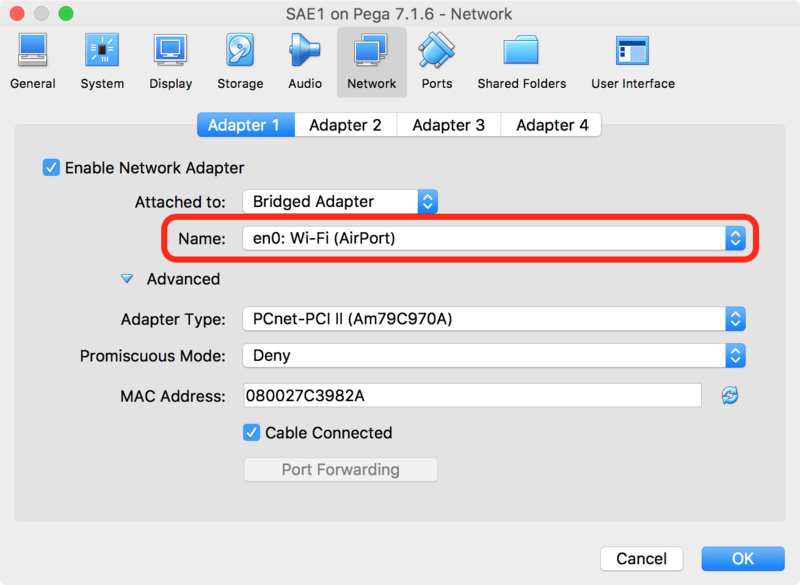 Click on the Settings icon in the VirtualBox menu and select Network and select the correct adapter on the host system to use for bridged networking. 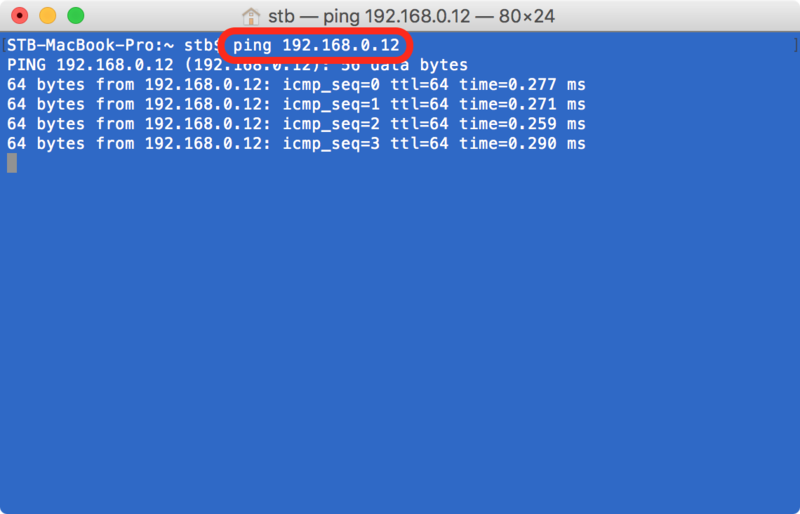 Here, the WiFi adapter of the Mac OS host system is named en0. 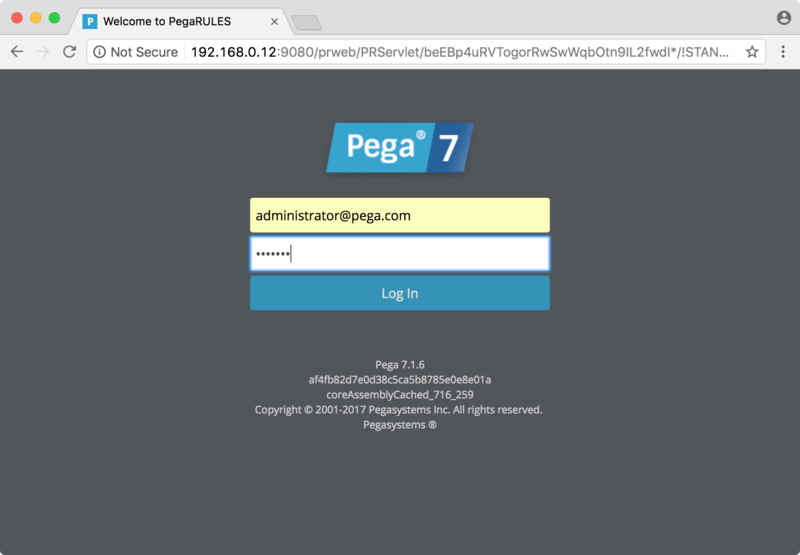 The Pega 7 Exercise System landing page can be accessed using the below URL. A section in the Designer Studio displays the latest news from the Pega Developer Network (PDN). 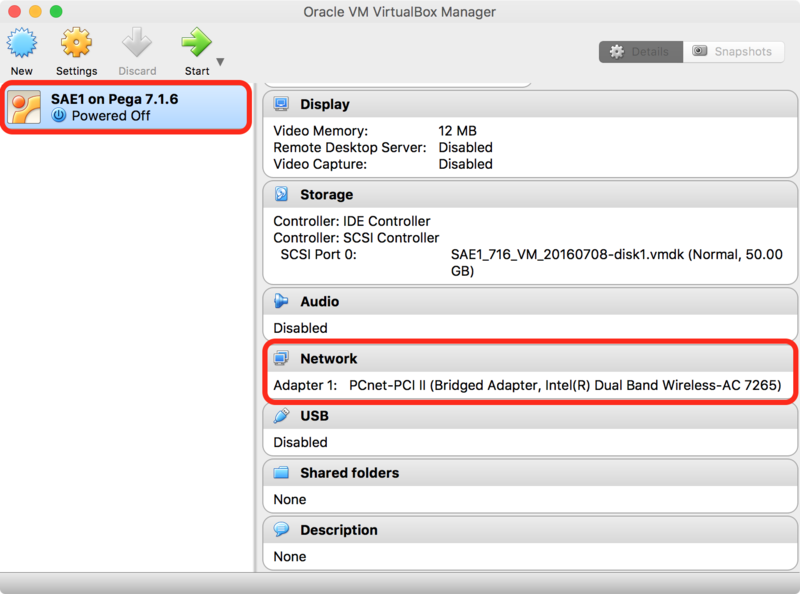 If that section displays the news feed correctly, it means that the virtual machine is able to connect to the Internet since the PDN news feed is retrieved through a REST service call from the Pega 7 system.